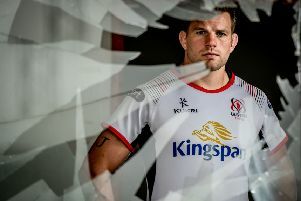 Captain Alan O’Connor believes the 4G pitch at the Arms Park won’t make in difference in Ulster’s must win game against the Cardiff Blues on Saturday afternoon. Ulster travel to the Welsh capital sitting fourth in the Guinness Pro14’s Conference B - nine points adrift of Edinburgh in the battle for the play-offs but with a game in hand. Jono Gibbes’ side are currently in the European Champions Cup play-off spot six points ahead of Benetton and the Italians have played a game more. With the Cheetahs unable to qualify for the Champions Cup Cardiff hold one of the three automatic places in Conference A and have a nine point cushion over Connacht. Ulster have won on their last three visits to the Arms Park. “There’s not that much of a difference on 4G,” explained O’Connor. “ The only thing that would be be the scrums, if you get it wrong, you are going backwards and you are going backwards over yourself, whereas out there (Kingspan Stadium) you have a bit more time to adjust in the mud. “We have the field (artiftical training area) out there and we would adjust by training out there on the Monday, it will be a bit quicker I think. Cardiff have won their last four PRO14 games and Ulster will come up against former Ravenhill fans favourite Nick Williams. “Yeah, looking forward to seeing Nick,” admitted O’Connor. “He has been banging out a few man of the matches, so he hasn’t faded away at all, he is still nailing boys, so yeah, be nice to catch him on the field. “Cardiff are definitely looking sharp, obviously they have their dangerous backs on that 4G pitch as well. We have to be on our toes for that. O’Connor is a captain that tries to lead by example on the pitch rather than words. “I just do my thing, nothing much has changed for me. “I say the odd word here and there, nothing much has changed for me in that role apart from running out in front of the lads. “I try not to mumble my words, once you start talking brown, then no-one listens to you. Ulster have lost their last two games and O’Connor is hoping the side can bounce back in Cardiff. “Obviously it is tough, so you have to look at yourself more than anything. p Cardiff Blues have appointed Australian John Mulvihill as their new head coach on a three-year contract starting from next season. Mulvihill has had spells as assistant and then interim head coach with Super Rugby franchise Western Force and most recently worked in Japan’s Top League.